Match your advertising to your customers. Identify your perfect customer and find out what they read, where they hang out and what their interests are. Then match your advertising to meet their needs. Make it easy for them to get in touch with you. Why is your product different? What can you do to attract customers attention? Think outside the box, use your story to make your product or service unique and stand out from the crowd. Don’t have time to market your business? 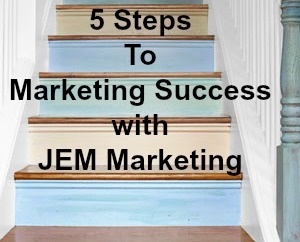 Get in touch with JEM Marketing today and we can help!